Deep in the Bible Belt, Navy Seals go undercover to save a town from the Demons from Hell who are stealing souls. Jack County was like any other Texas town in the Bible belt. It was a place where your soul meant more than your paycheck and where the little things in life mattered most. Churches were as common as gas stations. The corner store, the local watering hole and the barbershop were where friendly neighbors convened... until Demons from Hell showed up and took over the town. Now there's no stopping them. And if they can take over Jack County, what's next? But when a group of Navy SEALS are sent undercover and enlist the help of local bikers to take the town back, it's a race against the clock to save Jack County (and the rest of humanity) and all hell is about to break loose! 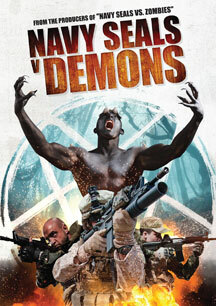 From the Producers of Navy Seals vs. Zombies, and starring real life Navy Seals and Special Forces Operatives. Producers follow up to the best seller video premier hit 'Navy SEALS vs Zombies', with over 50,000 combined units sold at national retailers! Director Jeffery Reyes also worked on blockbusters 'Saw', 'World War Z' and 'Battle Los Angeles'! From 'Navy SEALS vs Zombies' producers A.K. Waters & Stephan Shelanski.